Whispers in the Loggia: "Basically, He's Lucky"
[Stika] cracked a few jokes Monday, but he knows his diabetes is no laughing matter. Diabetes is a scary and dangerous illness that millions face nation-wide. [The bishop] suffered a mild heart attack as a result of high blood sugar levels. Now he's smiling as he looks forward to his second chance at life. Stika says, "I discovered returning to school, after 25 years or so, it almost killed me." He has a sense of humor now, but it was no laughing matter when he was on life-support for more than a day in Florida. Stika says, "I stand here today as a witness of the great power of faith and prayer." After studying Spanish in Texas, he visited a friend in Florida, ignoring the fact that he had been feeling ill for days. Stika says, "I've been a diabetic for almost 30 years, and I think I got to a point where I took it for granted, and all of a sudden a series of experiences, and in one day's time, I was near death." Stika says he will now live a much healthier life, and even challenged other members of the Knoxville Diocese to lose weight. Stika says, "This event will not just be a moment in my life, but it will be a part of my life." Stika says he has impaired vision in one eye, and doesn't know if it will ever function like it used to. He's also feeling fatigued and has lightened his schedule until he's feeling better. A self-confessed fast-food fan who's been trying to "swear off the stuff," Stika added that the first stages of rehab saw him "doing laps in the intensive care unit. "I was racing, I think, a 95-year-old man. I think it was neck and neck there for a while but I think I defeated him," he said. The 52 year-old prelate added that he's already signed up at a local gym. "I'm going to commit to that on a daily experience," he said. "I'm going to watch what I eat -- just recommit myself to those values I learned almost thirty years ago when the doctor first told me that I was type one diabetic." Moral of the story: gang, take care of yourselves. 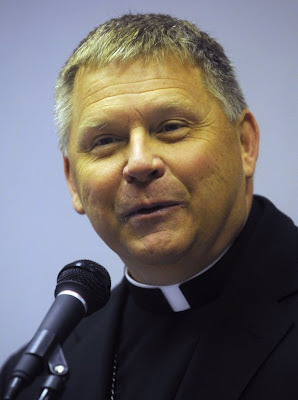 SVILUPPO: Earlier today, the retired auxiliary of Cincinnati Bishop Carl Moeddel -- another member of the Bench whose service was impacted by acute diabetes -- died at 71. Ordained bishop in 1992, Moeddel left active ministry early in June 2007 after a debilitating stroke. The news comes as the half-million member archdiocese enters the final stages of Archbishop Daniel Pilarczyk's transfer of governance to his coadjutor, Archbishop Dennis Schnurr, following the 26-year incumbent's 75th birthday earlier this month. Moeddel's funeral is planned for Saturday at the Queen City's Cathedral of St Peter in Chains.